Guimauve a la Framboise has a mix of copper and pink flakes and smaller pink microfleck in a clear base. Ugh. I can't handle this. Too pretty. How great will Framboise look in autumn manis? There was no way I was gonna pass this one up. The formula's good too. This is just one coat of the topper. The base is a bit thick, but it keeps the flakes in suspension well. That's what really matters. Pistache is a muted sage green cream. I talked myself down to just one of the creams, but it wasn't easy! Pistache was the must-have for me. I mean...it's green. This is my first Pahlish cream, so I wasn't sure what to expect. The formula is thin, but workable. 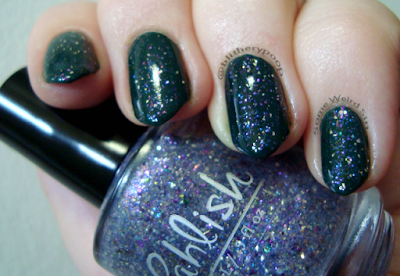 Pale shades like this can be trouble, but Pistache evened out well in three coats. Guimauve a la Violette has predominantly blue, purple, and silver flakes in a clear base. I know it's spring and we're supposed to be all about blooming flowers and chirping birds and all of that...but I'm at it again...I'm looking at Violette and dreaming of icy, wintry nails. The formula is the same as Framboise. This is also one coat of the topper. Bottom line: You need the toppers, right? They're both stunning and have great payoff. 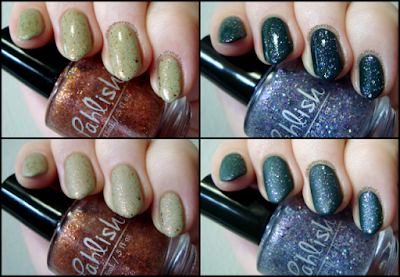 Stalk Pahlish on Instagram and/or Facebook to find out when they come back. Pistache is lovely too, but discontinued. I realized as I was writing this that two of my last three posts have been indies. Weird, right? They were also my first new indie polish swatches on this blog. There will definitely be more. I'm not shifting focus or anything, just showing off some of my recent acquisitions as I get back into the swing of things.